Khanderi is the second submarine of the Scorpene -class submarines, which are being constructed at the Mazagaon Dock Shipbuilders Ltd. File photo of INS Kalvari. Mumbai: The Indian Navy’s Western Naval Command is set to induct more warships and submarines in 2017. According to naval sources, submarine INS Khanderi will be set afloat this month. Khanderi is the second submarine of the Scorpene -class submarines, which are being constructed at the Mazagaon Dock Shipbuilders Ltd (MDL). MDL was earlier planning to set Khanderi afloat last month, but the plan was postponed in the wake of the mishap involving the Brahmaputra-class guided missile frigate INS Betwa (F39) that was undergoing a refit at the Naval Dockyard in Mumbai. 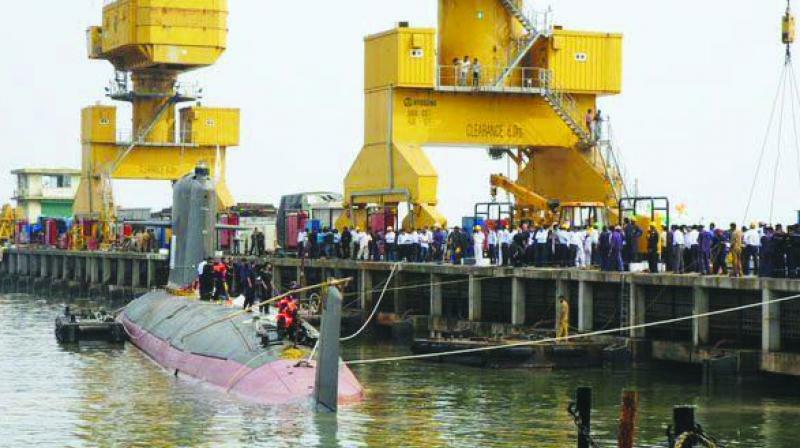 Two personnel were killed and over a dozen were injured when the INS Betwa tipped over during an undocking exercise.